The 700 is Belleville's flagship waterproof duty boot. 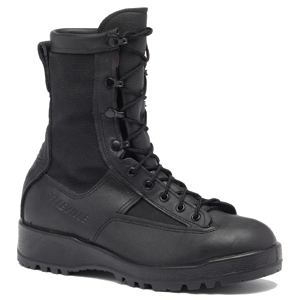 This boot was designed for law enforcement and military looking for a tough, full-size, Gore Tex patrol boot that will provide excellent comfort during long shifts. This boot features full grain leather and abrasion-resistant nylon for durability. A Gore-Tex bootie ensures your feet are kept dry and any moisture inside the boot is wicked away to the outside. VIBRAM's Sierra outsole has a large lugged design that provides great traction on uneven terrain and is petroleum, oil, and lubricant resistant. It is also re-soleable. The Belleville 700 is both Berry Compliant and made in the USA with pride. I'm writing this review after purchasing a second pair of Belleville 700 boots. My first pair finally wore out after almost 4 years. Actually, the leather part of the boot is still fine but the sole has been worn down so much that the inside of the boot is starting to show. I guess I could have resoled them but figured it was time for a new pair. I'm pretty impressed. These have been my duty boots working in a state correctional facility and have never given me a problem. Granted, they haven't been worn much in the dirt or outdoors but I can't really complain. Hope this new pair lasts just as long. Buy these! I bought these to use on the weekends for riding my Hawg (Harley Fat Boy). They keep my feet warm and seem to be put together well. I'm glad I researched and finally came up with these instead of spending $200+ on motorcycle boots. Got these for hiking here in Colorado. I spent the extra and got the gore tex which works great. I've been in water up past my ankles and my feet are still bone dry. Very impressed with these. I just bought these for work outdoors on the site and they feel and look great. These boots came directly from Belleville. Fast shipping. Good quality and comfortable so far. I'm glad these are still made in America.